Harry Cooper shows a 3.64-pound largemouth bass before its release. With snow blanketing Westborough this February, it’s easy to think of the natural world as sleeping – but what are all those people doing out on our frozen, snow-covered ponds? For ice fishermen and women, it’s no secret that things are alive under the ice. If you happened to pass by Lake Chauncy on Feb. 8, you might have noticed the action out on the lake. 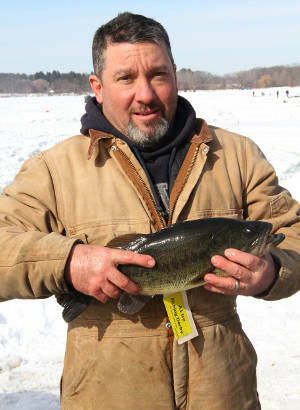 About 250 people – some local, some from far away – braved the cold and slush to take part in the Massachusetts A-1 Bassmasters Ice Fishing Tournament held there. 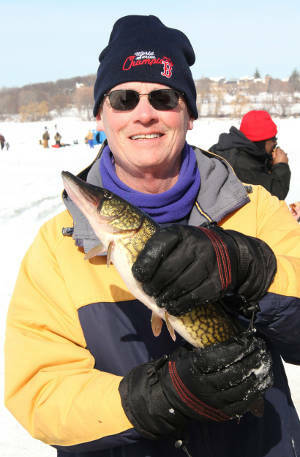 The ice fishing in this tournament was catch-and-release, so anglers who hauled up a big fish hurried onto shore to weigh their fish. Then they rushed to release it alive back into Lake Chauncy’s wintery waters through a nearby hole drilled in the ice just for that purpose. What were they fishing for? Major prizes were offered for the largest pickerel and the largest bass caught that day, so these fish were the desired catch. Pickerel and bass are probably the most common game fish in Massachusetts’ freshwater lakes and ponds, and they’re caught year-round. Chain pickerel (Esox niger) are native to Massachusetts and much of the east coast but have been widely introduced into other areas. The chain pickerel gets its name from the distinctive dark chain-like pattern on its yellowish to green body. It has a long, slim body and a long, broad snout. It has sharp teeth – a clue that the chain pickerel is a predator that eats other fish. Chain pickerel lead solitary lives. They like to hang out in weedy areas of the water, waiting for prey which they ambush by striking with lightning speed. If weeds are scarce, they seek out rocky areas or places with fallen wood, where there is good cover for them. In February, females carrying eggs go to shallow, weedy areas to prepare to spawn. The ice fishing scene on Lake Chauncy, with the former Westborough State Hospital buildings in the background, during the A-1 Bassmasters ice fishing tournament Feb. 8. All the fishing was catch-and-release. These fish average about 3 pounds and 24 inches, but people usually catch pickerel weighing 2 pounds or under. The minimum length allowed for keeping a pickerel is 15 inches. Chain pickerel can live 8-10 years. Largemouth bass are predators that mainly eat other fish, but even frogs, crayfish, birds, and small mammals that fall into the water can disappear into those large mouths. These fish hunt using sight, sound, and vibrations picked up by the special “lateral line organ” that fish have. Largemouth bass lurk in weedy areas or areas with rocks, fallen timber, or ledges. They also like areas with overhanging vegetation that offers protection. They tend to swim in groups and to travel to different parts of a lake by following the same routes which are much like hunting trails. Predators of adult largemouth bass (and adult pickerel) include herons, osprey, eagles, raccoons, and of course, humans. Many of us don’t think of fish as nesting, but when the time comes for largemouth bass to spawn in late spring, males make nests in shallow water (less than 6 feet deep) with sandy or finely graveled bottoms. The male fans his tail to clear a round depression. The female lays large numbers of eggs, often in more than one nest, and the male fertilizes the eggs as they are laid. The male guards the eggs and then the newly hatched fry. The fry stay at the nest for a while and then swim in schools until they’re about an inch long. After that, they’re on their own in an underwater world where big fish eat little fish. Largemouth bass can live 10-15 years. They average about 2 pounds but can grow up to 15 pounds. Females grow larger than males. The minimum length allowed for keeping a largemouth bass is 12 inches. In spring when the ice melts, chain pickerel spawn at water temperatures around 50 degrees, and largemouth bass spawn at water temperatures in the 60s. In the heat of summer, lake and pond water becomes stratified, with a very warm layer at the top and a cold layer at the bottom, and a transitional layer in the middle. Fish tend to seek out the water at the temperatures that best suits them, and also to go where their prey is found. Chain pickerel prefer water temperatures of about 70 degrees, and bass prefer temperatures between 70 and 75 degrees. Dennis Fenton, of Westborough, holds a 2.63-pound chain pickerel before releasing it back into Lake Chauncy. Note the chain-like pattern on the fish’s body and its long snout. According to MassWildlife, 5 inches of ice are needed to support a snowmobile or ATV, 8-12 inches for a car or small pickup truck, and 12-15 inches for a medium truck. Ice can vary in thickness on a pond, so it can be safe in some areas but not in others. The Town of Westborough does not monitor ice thickness, so people who use the ice do so at their own risk. People who go ice fishing are advised to go with a partner, carry ice picks (“pins” often worn on a cord around the neck) for stabbing the ice if they fall through, and roll toward thicker ice once they pull themselves part way out. MassWildlife advises that if a person falls though, others should remember "Reach-Throw-Go." This means that if someone CAN’T REACH the person who has fallen through from shore, he or she should THROW something to the person in the water, such as a rope, tree branch, jumper cables, or an ice ladder such as those that are sometimes placed on shore at public places. If that doesn’t work, GO for help. In other words, don’t go out on thin ice and get in trouble yourself. MassWildlife also advises people to keep pets on leashes near ice to prevent them from going onto the ice and falling in. Massachusetts has a year-round fishing season for pickerel and bass, with limits of five per day for each. More than 80 kinds of freshwater fish live in the waters of Massachusetts. Let’s keep them in mind as we use and conserve the lakes, ponds, rivers, and streams that are their homes.